With the continual expansion of our business we wanted to take our interest overseas. We have gone beyond all expectations. Expanding into Asia is the next step to be realized. 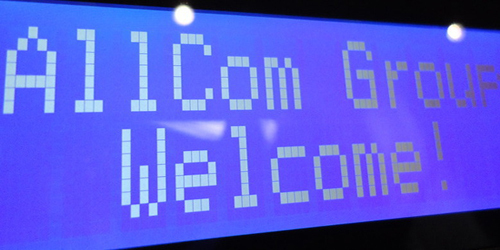 The AllCom Group (www.AllCom.ie) was established in 2011 to encompass our ever expanding list of subsidiaries, which now cover almost every aspect of the telecommunication industry. With the continual expansion of our business we wanted to start growing internationally, we knew we would experience entirely new challenges, questions and uncertainties. November 2004 we opened a branch state side - www.Templecom.com our US subsidary was formed. Based in Seattle, Washington, is a US based subsidiary of the AllCom Ireland Group. Our main services include electronic repairs, and supply of related parts and accessories. Our clients include multi-nationals, small business and sole traders. We have grown rapidly to become an organisation with branches in Ireland, UK, and the US. Dynamism and an entrepreneurial spirit are what set us apart from our competitors. The Lord Mayor of Dublin came on his 2nd official visit today to The AllCom Group head office, during his visit he met all the staff and had a talk about how well The AllCom Group have been doing since opening a branch on Dublins Upper Abbey Street. The Mayor has been driving the rejuvenation of Dublin by promoting trade, he recognizes the quality unique businesses can bring to a city and sees that companies in our industry are a driving force in the economy. The Mayor has been at the forefront of developing transport infrastructure in the capital and was at hand on the day we launched the first of our official couriers to transport repaired electronics around the city. The Lords Mayor talked with each member of staff while acknowledging and congratulating the extraordinary work they do for the people of Ireland. Pictured: L-R: GSMsolutions Workshop Manager: Patrick Buckley. CEO of the AllCom Group: Alan Donohoe. Lord Mayor of Dublin: Andrew Montague. GSMsolutions Marketing Executive: Lee Donohoe. GSMsolutions Sales Executive: Jonathan Buckley. CEO of Dublin city BID: Richard Guiney. We pride ourselves on providing a efficient, reliable and professional service. We like to believe we know our clients needs so our prerequisite of maintaining a fast-paced industry is technological innovation. We are continuing to grow by expanding our businesses in both the European and Middle Eastern markets. We are achieving this growth by applying the knowledge we've gained in Ireland to other countries. By doing this we are in an excellent position to achieve our aim to become the leading choice for international mobile telecommunication related services and products. With our diverse network of companies we encompass almost every aspect of the telecommunication industry. This effectively makes The AllCom Group a 'one stop shop' for all telecommunication related products and services. You can read about of full list of subsidiaries Here. Services: Electronic repairs are the lifeblood of the AllCom Group of companies, we repair and service a broad spectrum of items including Apple iPods, iPhones, iPads, Mobile Phones, PC's, Laptops, GPS systems, MP3 Players, Game Consoles, Mac, Cameras, Motherboards and most other general small electronic devices. In addition, we been on the forefront of GSM / phone unlocking software development since the late 90s. We have developed programs which are used worldwide by mobile phone service providers and retail outlets for mobile phone unlocking purposes. Over the years we have extended our capabilities to cover most popular consumer electronic devices on a No Fix / No Fee basis. For a complete list of our services please view our individual companies Here. Products: With our retail showroom located in the heart of Dublin city you can view and buy a vast range of accessories, parts, components and rare gadgets for most small electronic devices listed above. For a complete list of our products please view our individual companies Here. Products can also be purchased online. You can also buy wholesale as we provide extensive and substantial discounts on all products and services to the trade sector. More on opening a trade account Here. I stand behind my company and my people 100 percent. Our mission is to simply delight and satisfy our customers with affordable, high-quality services.